U.K. Tabloid Scandal: Former PM Brown Condemns News International : The Two-Way The scandal in the United Kingdom keeps expanding, and Rupert Murdoch's media holdings there have been rocked. 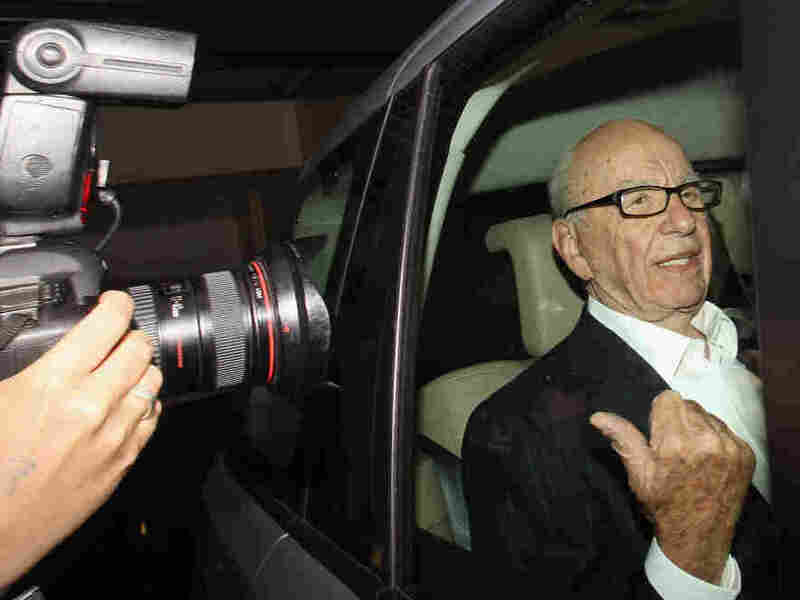 Rupert Murdoch as he left his apartment in London earlier today (July 12, 2011). -- BBC News — "Gordon Brown Attacks News International Tactics": Former Prime Minister Gordon Brown "has launched an all-out attack on News International accusing it of using 'disgusting' methods to gain access to personal information. [He] also alleged the newspaper giant had links to the 'criminal underworld.' And he accused The Sunday Times of gaining access to his personal bank and legal files when he was chancellor." One of the stories that a News International newspaper, the Sun, broke in recent years was that Brown's son has cystic fibrosis. Brown told the BBC he was "in tears" when he learned that reporters had obtained that private information. "News International said the Sun newspaper was satisfied about the methods in which it obtained the story about Mr Brown's son's medical condition." -- The New York Times — "British Tabloid Sought Phone Data Of Investigators": "Shortly after Scotland Yard began its initial criminal inquiry of phone hacking by The News of the World in 2006, five senior police investigators discovered that their own cellphone messages had been targeted by the tabloid and had most likely been listened to. The disclosure, based on interviews with current and former officials, raises the question of whether senior investigators feared that if they aggressively investigated, The News of the World would punish them with splashy articles about their private lives." -- Dow Jones Newswires — "Analysts Cut BSkyB As News Corp Deal Seen Dragging Into Next Year": "A slew of U.K. media analysts cut their price targets on British Sky Broadcasting Group PLC (BSY.LN) Tuesday as the saga surrounding News Corp.'s (NWS) attempt to take full control of the pay-television company is expected to drag into next year, with some quite bearish on the prospects of a successful deal. ... News Corp., through its U.K. division, News International, also publishes the Times, the Sunday Times and the Sun. It also owns Dow Jones & Co., publisher of this newswire and The Wall Street Journal." Earlier today on Morning Edition NPR's David Folkenflik spoke with guest host Mary Louise Kelly from London, where he's covering the story. As David explained, in the U.K. the scandal has "badly damaged" Murdoch and his company. "The lesson here is that the tabloid gods have been able to play with people from high to low ... those gods seem to have come crumbling down a bit here in London." The Atlantic, meanwhile, offers "a primer on British media after the News of the World scandal." Reuters has a scandal timeline here. And Murdoch's competitors are having a field day. A fresh headline from The Daily Mail: "Murdoch in meltdown: Shares plummet, BSkyB deal shelved... but will media tycoon sell ALL his British papers?"